200m2 Exhibition Stands has supplied a TRUSSwire exhibition stand to leading adventure tour operator Travel Talk Adventures. 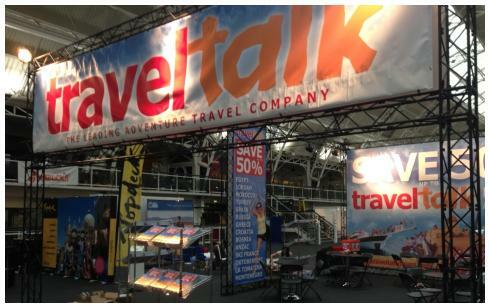 Travel Talk Adventures approached 200m2 in early 2013 with the aim of increasing its presence at the TNT Travel Show, London’s largest free travel show. With a new larger floor plan, Travel Talk Adventures was looking for a new exhibition stand solution which would stand out from the crowd. The new exhibition stand also had to ‘modular’ so that it could scale and adapt as required. After comparing solutions from several competing exhibition stand contractors, Travel Talk Adventures chose one of 200m2’s TRUSSwire modular exhibition stands. With a floor area of 10 by 6 metres and a vertical height of 5 metres, the TRUSSwire stand supported over twenty four square metres of printed displays. Despite being the biggest stand in the exhibition hall by 4 or 5 times, the entire stand was built in just 4 hours and took just 2 hours to dismantle. To find out more about 200m2’s range of exhibition stands and wider exhibition services why not get in touch today. Previous Previous post: Outdoor Exhibition Stands: Spring is here! Next Next post: Exhibition Stand Contractors UK: Who should you choose?